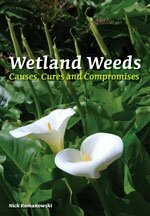 This comprehensive guide to wetland weeds covers both native and introduced species, ranging from minor or localised environmental problems to those that should not be tolerated in any situation. The author takes a pragmatic approach to weed control, recognising that some weeds may not be possible to eradicate, and emphasising the need to assess the extent and future potential of any infestation before taking action. Weed control should be planned in the context of the overall management goals for any type of wetland, the types of habitat weeds provide or overrun, and whether they can be replaced successfully with more appropriate plants. A range of strategies for controlling wetland weeds are considered, from containment actions to prevent the development of a soil seed bank to physical removal, and biological approaches from biocontrol to shading, overplanting and use of turbidity. The widespread use of chemical controls is also discussed, with the warning that these are often only a short-term cure and can cause more harm to aquatic ecosystems than the weeds they are holding at bay. More than 130 species of established weeds are included with information on their origins, nutrient responses, environmental effects, habitat values, prospects for containment or eradication, and even culinary uses. Other sections look at native plants as weeds, including a number of species of uncertain origins, and potential weeds still being legally sold through the aquarium and nursery trades. Nick Romanowski, zoologist and wetland ecologist, has spent more than three decades studying aquatic plants, including assessing the weed potential of hundreds of exotic species, and photographing weedscapes throughout Australia. He has worked in diverse aquatic fields from managing a wholesale aquarium to aquaculture, and his nursery Dragonfly Aquatics was the first to specialise in indigenous aquatic and wetland plants. Nick’s most recent books include the second edition of his best-selling practical guide Planting Wetlands and Dams, and Wetland Habitats: a Practical Guide to Management and Restoration, as well as a gardener’s guide to Australian grasses, sedges and rushes as alternatives to introduced species.